ST. GEORGE — The Senate is headed for a tense showdown over President Donald Trump’s Supreme Court nominee Judge Neil Gorsuch as Republicans move toward confirmation of the nominee and Democrats threaten filibuster. Though it may seem arcane, the approach is known in Congress as the “nuclear option” because it strikes at the heart of the Senate’s traditions of bipartisanship and collegiality. It would allow all future Supreme Court nominees to be confirmed without regard to the objections of the minority party. Next week, the Judiciary Committee will report the Gorsuch nomination to the Senate floor, where the same tactics will be in full view. Democrats are already claiming that the threshold for confirming Supreme Court nominees is 60 votes. They may wish this were the rule, at least for Republican nominees, but they know that’s not true. Democrats have been playing this game for years, embracing one standard when it suits them only to do an about-face later. It may be just a coincidence, but the flip-flopping follows an eerily similar pattern to election cycles when different parties control the White House. But, like I said, that may be just a coincidence. What I do know is that Senator Schumer voted 25 times to filibuster judicial nominees of President George W. Bush. Then, when nomination filibusters had declined under President Obama, he voted to abolish them. Now, with a Republican again in the White House, he’s back on the filibuster train. He was against judicial filibusters before he was for them before he was against them. Why not have a vigorous debate followed by an up or down vote? The 1987 nomination of Robert Bork was controversial yet there was no cloture vote, even though he was defeated. The 1991 nomination of Clarence Thomas was controversial yet there was no cloture vote, even though he was confirmed. Republicans have never even attempted a partisan filibuster of a Supreme Court nominee. Most recently, then-Majority Leader Harry Reid said in 2010 that he would file cloture on the Supreme Court nomination of Elena Kagan. Republican leaders, including our former colleague Senator Jeff Sessions, told him that filing cloture would be completely unnecessary. The truth is that no Supreme Court nominee has ever been defeated by a partisan filibuster. The only reason Democrats are choosing to push us in that direction is that their left-wing groups have told them to do so. Senate Minority Leader Chuck Schumer of New York warned against the rules change in an interview with The Associated Press on Thursday, arguing that Republicans would be the ones to blame if it does occur. 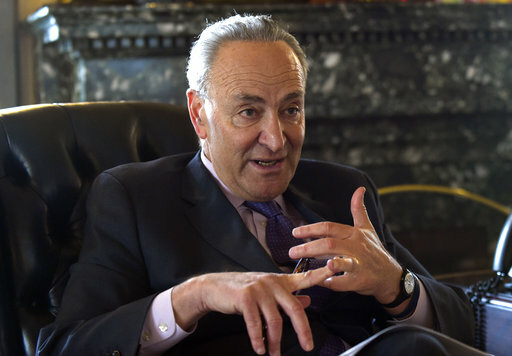 Schumer’s comments came after Sens. Joe Manchin of West Virginia and Heidi Heitkamp of North Dakota became the first two Democrats to announce their support for Gorsuch, and the only ones so far, the Associated Press reported Friday. Written by MARY CLARE JALONICK, Associated Press, and ERICA WERNER, Associated Press. St. George News contributed to this report from information provided by the Offices of Sen. Orrin Hatch. and Copyright 2017 The Associated Press as to portions it contributed. All rights reserved. This material may not be published, broadcast, rewritten or redistributed. Posted in Government, National, News, PoliticsTagged cedar city, chuck schumer, confirmation hearings, filibuster, Mitch McConnell, Neil Gorsuch, Orrin Hatch, rules change, U.S. Senate, Washington D.C. If I think back to 2005, when John Roberts went through his confirmation process, it was striking how his intellect was an order of magnitude higher than the folks asking him a bunch of stupid questions, like Ted Kennedy. Time and again he had to refrain from answering stupid questions, asked by senators who should have been forced to retire many years prior. His patience paid off with elevation to Chief Justice right away. Neil Gorsuch comes across to me as the same quality of legal mind as John Roberts, and here again he had to avoid answering numerous stupid questions posed by Senators who brought zero intellectual capacity to the session. His background was carefully vetted, and confirms my view that we should be thankful that he accepted his nomination, by a severely flawed POTUS. In the next three plus years we are bound to have another opening, or two, when assessing the existing eight SCOTUS justices. My hope is that Gorsuch was on the top of a list of several potential nominees, and that lists gets regularly updated so we can fill the next opening quickly. I would love to ask Sen. Hatch why he won’t retire and allow fresh ideas in. He and others who have been in there for more than 10 years are there only for their benefit, not ours. They can only spout party mantras, tell us how much they LOVE public service but have no interest in doing what make sense for our country or citizens. They had 6 years to develop a sound health care system, but instead tried to toss something together in 60 days that turned out worse than what we currently have. It’s time he and his ilk be asked to leave. Never before, in the democrat party, have so many knew so little about so much. You obviously didn’t vote for Hatch so your whine doesn’t count for much.